Ahmed accepted the offer with enthusiasm. As they played, he had so much fun with his new teammates, and he excelled in practice. One day, Ahmed thought it would be a great idea to invite some of his friends over to meet the coach and scrimmage with the team. Ahmed’s friends were the best players from another ‘All-Star’ team in the district. Ahmed was shocked by the coach’s tirade because his intentions were innocent. Ahmed tried to explain things to the coach, but he wouldn’t listen to Ahmed’s open and honest discourse. Ahmed was hurt by the coachâ&#x20AC;&#x2122;s comments because the coach questioned his integrity. Ahmed knew that he had done nothing wrong. He felt that real teamwork embraced openness, honesty, and friendship. Although he told his friends they couldn’t come, he felt something was not right with the coach’s approach. Ahmed couldn’t sleep that night because his integrity kept him awake. The coach had decried the very human values by which Ahmed played and lived. The next day, Ahmed quit the team. His teammates were saddened by his departure, but they understood why Ahmed left after he explained things. And even though Ahmed gave up his chance to be an â&#x20AC;&#x2DC;All-Starâ&#x20AC;&#x2122; and win the tournament, he gained strength in his integrity and secured a victory in life. This book is dedicated to the Love that resides in the hearts of everyone. Learn more about the projects above at www.hv4k.org/framework . 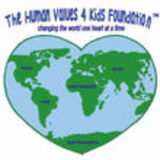 The Human Values 4 Kids Foundation is a nonprofit organization dedicated to promoting universal human values in children. All products, projects, and programs developed by the organization have this aim in mind and contribute to this end. The organization operates on the premise that there is no solution more effective to solving the problems facing our world than to elicit the innate wisdom that resides in the hearts of our children. The organization has been built on the foundation of Peace, Truth, Righteousness, Nonviolence, and Love. Hence, the vision for The Human Values 4 Kids Foundation is to change the world one heart at a time through values that apply to all people at all times in all places. The Adventures in Human Values books are simple, yet powerful stories that teach kids about the importance of basic human values. Join Shivam, Khiara, Dorian, Elizabeth, CJ, Julia, Ahmed, Melia, and Keisha as they learn about GOODNESS, EDUCATION, APPRECIATION, FOCUS, MERCY, DETERMINATION, INTEGRITY, EFFORT, and OPEN-MINDEDNESS in this inspiring ninth series. If we are to change the world for the better, then it must begin in the hearts of our children.